As Matt describes it, he holds a 'mosaic' of different jobs, including Cider Maker at Carr's Ciderhouse, and Grower at Small Ones Farm, but they all relate to apples in one way or another. To call it an obsession would do a disservice to the thoughtful connections Matt has forged with the work that he does; he highlights climate change as the biggest threat to the future of apples, and education as the key to growing and expanding the food economy. Imagining the apples that thrive under his care, we can't help but feel that Matt is making the world a better place. It was during my 2nd year of undergraduate studies at Hampshire College. I had 15 bushels of freshly picked heirloom apples from gnarly old twisted trees before me, and I was in the glow of the bounty, about to press cider for all my friends and feast upon fruits of the land solidly for the next month. That was it! At the time I was seeking a space to engage in farming tasks without direct staff oversight. I arrived at using the campus's derelict orchard as that space. I organized a group of students enthusiastic about farming to learn to maintain apple trees together, and we undertook to prune all the trees during the Winter and Spring of 2013-14. Under the guidance of a UMass upperclassman, Edgar Foudray, I found new passion in this and quickly amassed a library of apple literature: Michael Philips, John Bunker, Frank Browning, Ben Watson, and Claude Jolicoeur are a few influential authors. From there I dug deeper yet into the region's history of apple cultivation. Humans and apples have come up together with many parallels. In New England, there are such palpable remnants of older periods of apple cultivation all over the tended & untended spaces of our landscape. The context of exploring that history via old orchards, roadside wild apples, and places of modern production all helped me to forge a more tangible connection to the land on which I live. 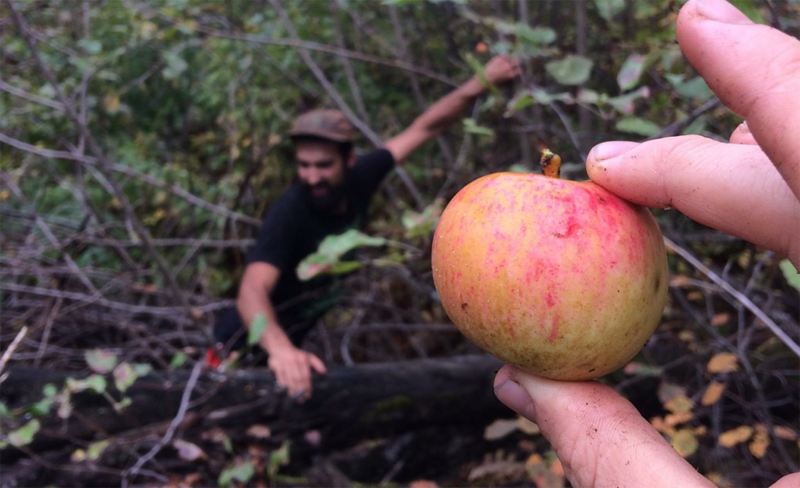 As part of my thesis at Hampshire, I penned the Wild Apple Forager's Guide, an educational handbook for apple foragers to use as a reference and methodological guide along the hunt for apples. So at that point I was truly eyeballs-deep in studies and love for apples. In the years to come, I found work at area orchards and cideries, where I further confirmed my passion. Without my mentors (Bob Fitz at Small Ones Farm, Edgar Foudray at Salt Marsh Farm, and Jonathan Carr at Carr's Ciderhouse), I wouldn't be involved in the movement of good food. Realistically, the entire community of apple people are all a great network. We all mentor each other - our interests overlap in so many ways and in so many places, that new friendships and mentorships are being forged all the time. It's a nice time to be working with apples, and I couldn't imagine doing anything else. More than holding one job in good food, I occupy myself with a mosaic of jobs in orchard and cider-related work. I was drawn to all of my places of work simply through seeking others who had similar interests, places of cultivation, and a need for an enthusiastic young orchardist. I am lucky that the folks at Carr's Ciderhouse and Small Ones hold perspectives on growing apples, contributing to a regional identity of the foods made from them, and of sustainability in general that mirror my own so much. I'm always grateful for the great employees and colleagues I with. Gnarly Pippins is just a year-old entity at this point. I started it as a launching pad for the Wild Apple Forager's Guide, and as a web presence for me to wax poetic on apples, deliver my interpretation of growing conditions, and to deposit findings from various extracurricular apple & cider projects. It has grown to be more than that, though: it's the name I've taken for any of the freelance services I offer such as the procurement and sale of wild apples by the bushel, tree pruning services, educational seminars and workshops, grafting service and nursery work, etc. It's growing with each day, and I am grateful for the exposure it has had so far. The greatest obstacle in the pursuit of my good food dream is far from tackled. Global warming poses the most serious obstacle to my desired career path. Apples being a very sensitive crop to climatic instability, we have no true remedy for the crippling losses that come from late frost after blossom buds are exposed. As Winter and Spring grow to drift into one another in unseasonable patterns, the dormant period that apple trees must maintain is disrupted irreparably. If the instability worsens in the coming years, we may see a sharp decline in the economic viability of cultivating apples on land. To shape more resilient orchards, we must consider a lot: agrobiodiversity of tree fruit crops and polycultural resiliency being the two primary areas that I have on my mind. Learn about how climate change has already adversely affected fruit crops at gnarlypippins.com. I am very grateful that my bosses have been kind with their soil. All of my farm bosses have allowed me access to use small parcels of land to cultivate crops of my choosing. Be it a garden plot for growing vegetables, or a trellised nursery row to raise rare and experimental wild apple varieties, access to bits of land is something that any farmer can reasonably do for their workers to allow them to manage something entirely their own, use their creativity and wherewithal to put agricultural ideas into motion, take a dent out of the cost of feeding one's self, and even to contribute color and vibrance to the farm in general. Education. We need more educators. I aspire to teach people the art and science of growing fruit trees, caring for them, exploring for fruit trees in the wilds, and using the harvest in practical ways. I find that with the demand for knowledge surrounding self-sufficiency, home gardening, food preservation and homesteading on the rise, it only makes sense that education on these topics be incorporated into institutions of learning way more than they currently are. I happily host workshops, teach classes, and open up my calendar and personal resources to folks who wish to learn about the work I do all around the orchard calendar. I count on fellow agriculturalists for the same type of willingness to teach and share knowledge. It is just part of the ever-evolving food economy today, but it is perhaps the most valuable, because in education is the potential for even greater work to come after the teachers. Land, or apples. I can make abounding use of either of those.